The final stage of the Giro. This year’s edition has seen a daily battles and drama but this is surely a procession into Milan. Still there’s a sprint finish and the points jersey is up for grabs. Stage 20 Wrap: the Colle delle Finestre delivered what it promised. Ilnur Zakarin survived the early breakaway and took flight on the pass and was only caught by Mikel Landa near the top with the Basque taking the Cima Coppi prize. Landa’s move had split the lead group and Alberto Contador was the big loser on the slopes, his dancing style rendered ineffective on the gravel slopes. He seemed to wince as the attacks were going – as if cramp struck but he didn’t stop pedalling – and whatever it was he could not follow the pace. There was no panic given he was ahead by minutes on the general classification but he looked nervous on the descent, sprinting out of the hairpin bends with his hands on top of the brake hoods. On the main road to Sestriere he got into time trial mode and managed the moment, crossing the line with a fist pump celebration. It was a rare moment of vulnerability. Fabio Aru won the stage, Astana’s fifth stage win so far but it was a chaotic day for the Kazakhstan crew. Landa’s sprint for the Cima Coppi reduced Zakarin’s day long efforts to nothing so the Russian refused to work with Landa on the road to Sestriere. They quarrelled and were duly caught. Landa attacked from the lead group only to find Aru jumping on his wheel. After another day on the offensive Ryder Hesjedal moved up two places to fifth overall while Yuri Trofimov fell from sixth to tenth overall, just 23 seconds behind Alex Geniez, the Colossus of Rodez. The Route: a flat procession from Turin to Milan across the Po plains and its rice fields. The race passes the Milan Expo site and then does seven laps of a 5.4km circuit past the Vigorelli velodrome with the finish line on the Corso Sempione. The Finish: flat and wide with the finishing straight almost 1km long. The Contenders: Giacomo Nizzolo reckons he’s cursed after several second place finishes but the truth is he’s not enjoyed the lead out that Sacha Modolo gets the Lampre-Merida team but now he’s on home soil and has targetted this stage for some time. Among the other sprinters Elia Viviani and Moreno Hofland both have the speed to win while Luza Mezgec had a quiet Giro last year but popped up to win the final stage, boosted by the proximity to his home in Slovenia. Weather: sunshine and clouds with a top tempature of 24°C. TV: as ever the finish is forecast for 5.15pm Euro time. Cyclingfans and steephill.tv both have links to pirate feeds with the latter also listing where you can view the race properly too. The Giro is: the Tour. As great as this year’s Giro has been, Contador’s win is being viewed as a stepping stone to the Tour de France. He’s yet to win the Giro but already the talk in Sestriere was about his chances for the Tour, recovery and more. It’s a problem for the sport when triumph in such a wonderful race is celebrated but chased by questions of what comes next. Does tennis view a victory at Rolland Garros for its significance for Wimbledon? Does Landa have a contract for next year? Think he might want to move on to a team he can lead. Contador looked beaten yesterday for the first time in the Giro. Dangerous game to be isolated on that surface. Losing 45 seconds to a puncture or mechanical might have made things interesting. His team haven’t been there at the end enough. I can only presume Kreuziger is undercooked and riding up to the tour. He has been invisible. Not only that, but if Landa had finished top two in Sestriere, he would take the Mountain jersey. Seemed like he was disappointed working hard for Aru up Sestriere knowing he would probably lose out on the Mountain jersey. What’s the basis for asserting that Contador’s Tinkoff squad was weak? The fact that Contador was “isolated” in the final of the moutain stages? I believe that all GC contenders were “isolated” at that point in the stage, except for Aru. My impression was that Astana was astonishingly strong, not that Tinkoff (and the other teams) were weak. It’s true that the Giro victory deserves being celebrated on its own merits. But since there hasn’t been a giro-tdf double contender for years it’s only natural that you start positioning ac for the tour, albeit not yet having won the giro! I don’t see it as disrespect towards the giro. 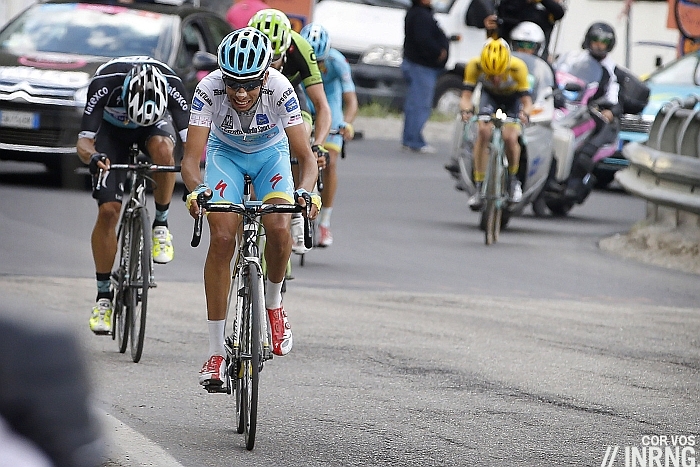 It seems quite obvious that Landa was called back to help prepare a stage victory for Aru. Which was quite a shame because Landa could have gunned for mountain jersey if not the the pink jersey (though doubtful if he could have taken that much time on Contador). Perhaps they didn’t realize how much Contador was struggling – or perhaps they were just too focused on Aru? Landa’s prolonged but futile gesturing at Zakarin (what did he expect after mugging him for Cima Coppi?! ), which I met with the jeering contempt it deserved, suggested Landa wasn’t called back to help Aru for quite some time (which the link confirms). Brilliant riding by Contador all Giro, his ride on the Mortirolo, and keeping a cool head and limiting his losses yesterday all far more impressive than a headline stage win. Looked like (amongst other things) Contador bonked – thought I saw him wrestling with a gel/bar whilst still sprinting out of a corner at one point on the descent? Contador claimed it was dehydration as he weighed less yesterday morning. Didn’t take in enough fluids the day before during recovery. So many details go towards winning. I keep wondering if Ryder/Garmin haphazardly lost time on Stage 4 so he wouldn’t be marked going for stage wins and then being viewed as an underdog. Under the assumption that he wasn’t going to be able to beat AC, Aru or Porte, or win the time trial – this could be a rational but risky strategy. He clearly was a lot more present than Amador, Konig, Geniez, and Caruso. From a perspective of publicity for Cannondale-Garmin – one could argue that it worked. The guy attacked on so many stages – 9,11,15,16,18,19,20.. I am not saying this to take away from AC or Astana – they were awesome. Can’t help wondering if Landa knew the story of Roche and Visentini in Sappada… Why did he obey his team so much? What is it Vinokourov and Martinelli could have done to him? And about this last day’s parade… What a waste. When will GTs understand that, when your race has everyone’s attention, on a Sunday, the last thing you should be proposing is a very-very boring pan-flat stage finishing in a sprint. Just about everything else would be a better idea. But Landa could have been prevented from riding the Vuelta – plus disobeying team orders probably goes down badly with prospective future teams. Complying to teamorders was the only thing Mikel Landa could do! He already has the “not reliable/not constant” label written all over him from the last two, three years. And the cycling-circus is small, you always have to deal with the same people again, even if the names of the teams may change. If he would have raced for himself yesterday, he would probably not get anywhere in the near future. From what he says, it seems he has found some purpose in this Giro. So for his future it was the only thing to do and -away from that – it was the right thing to do. Why Astana didn’t go for the mountain jersey? Don’t know. Maybe they had lost the overview. Or it is better to leave it for others or they thought Aru really could get the two minutes more. 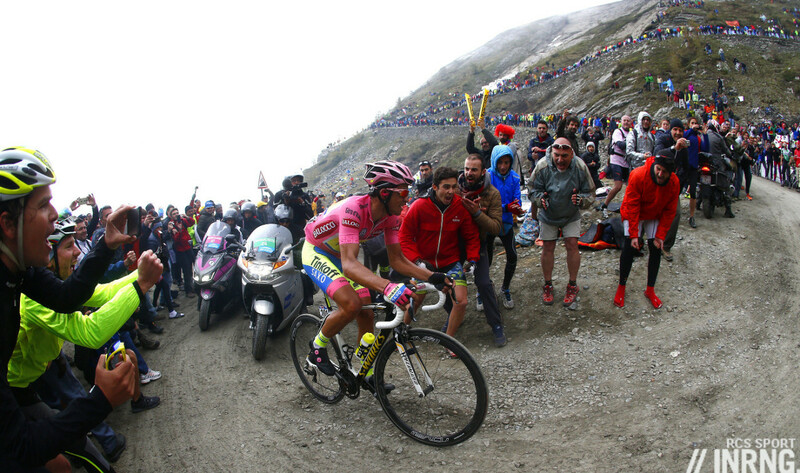 I think they, like anybody else, thought Alberto Contador would loose no more time in this Giro and when the unthinkable happened, they realised too late it was serious “now or never time” and panicked a bit. Shows one more time, how important it is too appear strong on every day, even if it is flat as a pancake. Alberto Contador seemed unbeatable and so they saw too late that he was in trouble. Work out the mountain points numbers. If Lamda had finished second to Aru on the stage, he still would have won the mountain jersey. Perhaps Astana took a risk calling him back to help and, in the end, Lamda did not have the legs for the final run to the line. Good ride though, might make him a valuable sidekick for somebody next year. Yes, but having done nothing to bring Aru back – obviously – I don’t think Landa wanted to sprint against the other guys (pretty common in cycling). But who knows? Maybe they just hadn’t thought it through. With a 6th place Leopold König will now have finished better in ALL grand tours compared to Richie Porte. No doubt, that outside grand tours Richie Portes palmares are much better than Leopold König. And Richie has been working hard as a super-domestique in many grand tours. But I think Richie needs to start looking over his shoulder. I see no problem at all: Leopold König is a real Grand Tour rider. He can get through tough days, he can limit his losses, his body needs workload, so he can ride more than one Grand Tour on a high level and he gets better or at least keep his level in the 3. week, when other start to fade. He needs much less teameffort to get great results. I don’t think he could shine consistent in shorter stage races like he can in Grand Tours. Richie Porte seems to be more suited to shorter stage races, where also the stress – and attentionlevel is a totally different one. Shorter stage races are prestigious and tough, too. So to me it seems to be a perfect situation, not a problematic one. Very easy, if you look at it like that and leave things like nationality, popularity , feelings etc. aside. No, from the impartial perspective it is not a problem. But I think Richie Porte will have to evaluate his options together with a future team. His contract with Sky ends in 2015 and he has previously stated that he would leave Sky after this contract. Top information that. Very interesting. I hope for big things for Leopold. No doubt, inside GTs, Richie Porte has been working for someone. Really hard. Did Viviani throw away his chance to win the red jersey by stopping his sprint and coming about 12th in the last sprint stage? 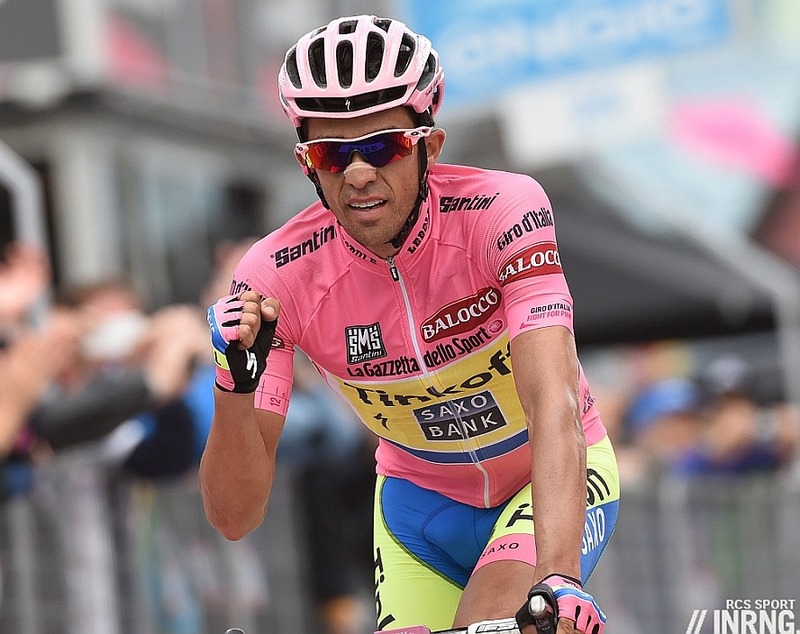 Contador never looked like losing it – despite the excitability of the commentators. Shame for Landa, but 2nd was definitely the best he could have got. Many thanks again INRNG, you and the commentators help immerse the fan to a whole new level in the three weeks tours. To answer your question, I think there maybe a differential in prestige associated with winning Wimbledon and Roland-Garros, but nothing like the hierarchy these days that says the Tour>Giro>Vuelta. After all, the most prestigious feat in tennis is winning all 4 (us, australia, france & england) opens. While winning a load of Tour de F’s beats winning all three gt’s — no? Judging doping by patterns and tactics is a bit like a Rohrschach test, people imagine they see things. A rider is strong all race long is used to imply doping because of this inhuman effort; a rider who has an erratic time is judged to be doping because they looked out of the race only to bounce back. More than a Rohrschach test, since given a few years hindsight, a few investigations, the aforementioned erratic riders or those who display inhuman efforts are indeed guilty of doping (see e.g. TdF winners from 1992 onward). As far as I see, it is only a matter of time before they are tested positive or admit to it. In the interim of course the show goes on! How do you know what is suspicious or not? what are you basing you suspicions on? One of the real problems cycling has is that it doesn’t have a baseline. It does not have a period of ‘largely’ dope free cycling, with the unique specimens that are elite athletes displaying what can be done without the juice. I see your scepticism, as a whole as you believe a certain performance must mean doping, but how many mountain stage attacks would be seen as ‘clean’ and how many is too many and must be doping? For the time being, I’m optimistic that riders are thinking they have a choice to not dope and still compete. The peloton is trying to police its self a bit (perhaps overstepping the mark in twitterland) testing is better. blah blah blah. But Sometimes it’s nice to give them the benefit of the doubt and enjoy the racing. and not sure tennis would survive a testing regime like pro cyclists have to endure. I was asking Oliver the same question: I must admit, I struggle to understand what exactly you want to say? You say you don’t believe in riders that ride good every day and you don’t believe in the ones who ride erratic. So, do you want to say the only thing “convincing” you, would be if all riders ride bad? But even then one rider would be the best of the worst. This would mean you would be again where you started. Or do you want to say it doesn’t matter how a rider rides, you think they are all doped anyway? Then it doesn’t make much sense to take the way someone is riding as a reference point for doping. I can totally understand what you say about hindsight etc., don’t get me wrong, I just don’t understand your reasoning or your logic. Saw a rumor of Landa moving to Sky but not sure if that is just the default rumor. Any rumors of note on his future? It’s just that. Riders signing for a new team cannot say anything until August. Whether he’d fit at Sky is another matter, he might join if Porte leaves otherwise he won’t have many opportunities to lead. Has the points allocation changed in the Red Jersey competition? If not, I’m surprised Nizzolo has a reasonable lead in it, despite not winning a stage or (seemingly) performing any Sagan-like feats in earning points on non-sprint stages (e.g. Stages 3, 12, and 18). Just a poor quality competition this year? In 2013, Cavendish was desperately searching for intermediate points, despite winning four stages (eventually five), including one stretch result. Can’t see CCC getting another invite any time soon: anonymous. Colombia would have done a lot more. Tramlines at 150m? Seriously? Organise a race properly. Telling how often it’s the Giro that has problems with the course. Embarrassing and amateurish. I am so happy for Iljo Keisse that he got this great win!!! Iljo got his dad a wolf all by himself! Thought it was rather classy the way Iljo Keisse thanked Luke D. after they crossed the line. Yes, it was a nice and fitting way to end this Giro. i think keisse said sorry to durbo before he hugged him. nice guy apologizing for taking the win. you gotta be ruthless in a two up like that. Absolutely. And great that a guy who has had so much misfortune has got a big win on his palmares. Thanks INRNG for the excellent coverage of the Giro.